A new garage door can significantly improve the security, look and value of your home as it can account for over 20% of your home's frontage. The most common questions we are asked about new garage doors are answered below. However, if there is anything else you would like to know then please contact us. 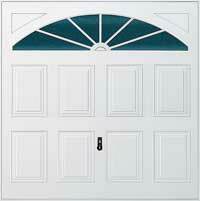 A garage door directly impacts on how your house looks. Replacing an old or disliked garage door is an excellent opportunity to improve and personalise your home's appearance. Choose a design that not only compliments your home's design but also one that blends in with the surrounding area and fits in with your lifestyle. When choosing a garage door, as with any home improvement product, there will be aspects of its looks and maintenance which will sway your decision. While all the one-piece doors we supply are manufactured using high strength reinforcing steel bracing to ensure rigidity and longevity, the material used on the surface face of your door needs to be carefully chosen to suit your requirements. to pre-finished doors which can be painted on site to suit your requirements. GRP Garage Doors (Glass-reinforced Polyester) garage doors offer the user a virtually maintenance-free finish combined with unrivalled aesthetics. With the choice of gloss white or authentic wood grain finish, the range of popular designs with crisp, clean detailing will complement any house style. GRP garage doors need only the occasional wipe down to retain their quality finish. 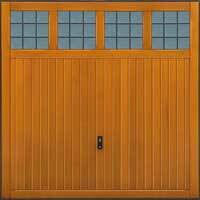 Timber Garage Doors combine the warmth and beauty of real wood. Supplied treated with a micro porous neutralising base stain to resists the rigours of our traditional climate. 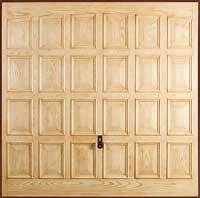 Most timber doors are supplied unstained to allow you to match your existing timber work. They also require annual care and attention to retain their good looks. Often the most puzzling of decisions is the choice of lifting mechanisms. Basically this choice will effect the opening characteristics of the door, the amount of drive though clearance and how much space the door will take up in the garage. 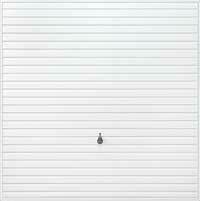 Retractable Garage Doors offer exceptionally smooth opening actions and are ideal for electric operation. 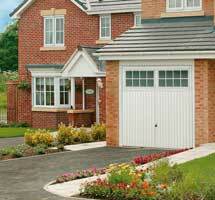 Canopy Garage Doors are quick and easy to install and take up less space in the garage when opening. Once open, approximately one third of the door protrudes creating a canopy effect. Roller and Sectional Garage Doors are suitable when garage doors are fitted in areas where there is a short driveway or garage opening close to a public area (such as a pavement). Side Hinged Garage Doors are often used when there is a requirement to maintain a traditional image or for a more practical reason of obstructions within a garage that prevent the use of an internally opening door. Glazing Selected garage door designs are glazed, with a range of attractive designs to blend with your existing house windows and doors. Allowing natural light into the garage, a choice of glazing also allows you to personalise the look of your garage door.